Don't miss out! 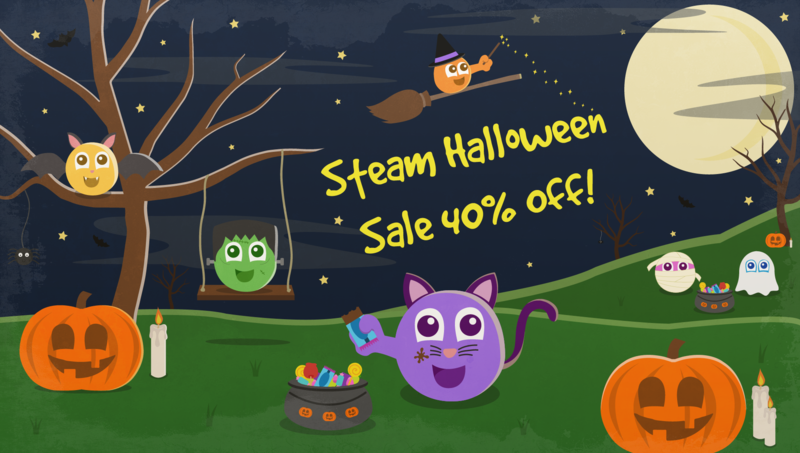 This spooktacular sale ends on the 1st of November! Putty Pals is a colorful, feel-good adventure of squishy teamwork to share with a friend! Two adorable bouncing blobs are lost far from home, and only teamwork, communication and a whole lot of hilarious mistakes will guide them back. Sitting side-by-side on the couch, you and a friend will glide, bounce, squish and swing your way through a vibrant cartoon landscape, solving puzzles, avoiding danger and uncovering hidden secrets. Putty Pals isn’t just a single-player game that two people can play together. It’s been designed from the ground up to be a cooperative two-player experience. You know what Putty Pals isn’t? BROWN! Play as colorful characters in a colorful world and enjoy a fun, feel-good experience that will leave you smiling. Share hours of fun with your co-op buddy as you bounce your way through a bonanza of challenges and collectibles. Is there a solo mode? Putty Pals was built to be co-op, which means you need two characters on-screen to solve its puzzles. However, for an extra challenge you can sit at your keyboard alone and control both characters at once. It’s tricky, but it can be done! We wanted Putty Pals to be a pure, old-school couch co-op game, so we designed it for two players to enjoy sitting side-by-side. We don’t feel that online play creates the same sense of shared playfulness, so Putty Pals is local co-op only.